Auto-load multi-blade cutter for jobs requiring continuous blade This revolutionary multi-blade knife easily meets the needs for continuous blade change with automatic blade load feature. It holds up to 5 blades, that’s 65 new cutting segments per load, all stored in a sleek, comfortable handle for maximum productivity on the jobsite. 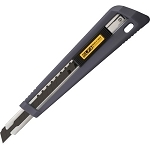 Features an automatic blade lock and is packed with 2 UltraMax® blades. UltraMax® ultra sharp durable snap-off blades are 25% sharper than OLFA AB blades. Easy, tool-free blade change for convenience. Uses any of the Olfa Standard Duty Blades below.